Below is a table of all the possible skill moves in FIFA 14. Remember that pretty much every skill move requires for the left trigger to be held down, without it your player will just dribble normally if you are moving the right stick. These controls are the same for both the Xbox and the Playstation, although on the Playstation the trigger you want to use is L2. Note that just these core moves are not the only tricks you can do; you can combine them however you want to create your own unique skill move. Please note that many of these skills can be done with either foot, so they have two versions, which are done using opposite sides on the analog stick. Each move assumes that you are facing forward, so just remember the orientation when you're facing another direction. For a detailed guide of how to use these skills most effectively - check out FIFA Encyclopedia's very own Supreme FIFA 14 Guide. We thought we needed to provide a guide with a little something extra in terms of teaching players how and when to use skill moves to fool their opponent. 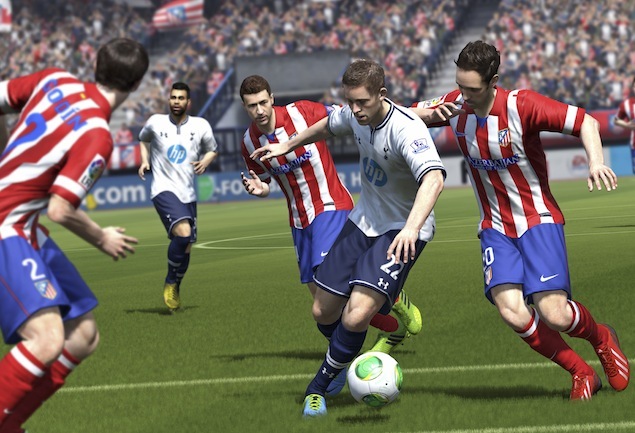 Looking for a list of FIFA 14 5-Star-Skill move players? Check out our 5-star-skill player guide! hold Right Stick L then 90 degrees counter- or clockwise. While juggling, LT + hold Right Stick L.
While juggling, LT + Right Stick D, clockwise twice fast.